Working on a dessert menu for Ramadan? Here is an easy-to-prepare dessert that provides great value-for-money. 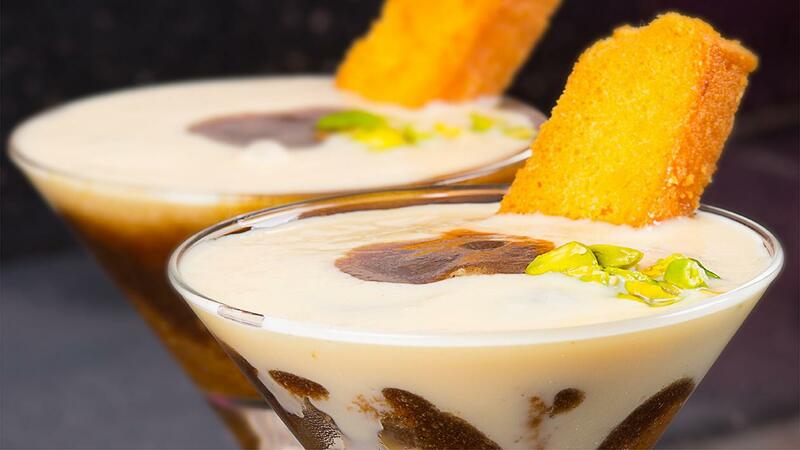 Download the Date Caramel and Custard Parfait recipe below! Add 4 tablespoons (60 gm) of Rafhan Vanilla Custard in one cup milk (200ml) and make a paste. Mix 8 tablespoons (120 gm) of sugar in 4 cups of milk (800ml) and bring to boil. Add custard paste to boiling milk and cook while stirring until texture is thick and smooth. Rafhan custard is ready now. Brew Lipton Yellow Label Tea Bags in boiling water for 5 minutes. Keep 100 ml of brewed tea for the cake base. Remove the tea bags and add brown sugar and dates. Cook down to a caramel by adding milk, cream and butter as the mixture becomes thicker. Arrange the cake rusks in a glass or dish. Combine the brewed tea with the vanilla extract. Soak the rusks and the start layer the parfait. Whip the cream with icing sugar till soft peak. Add a layer of date caramel, whipped cream and finish of with the nuts. A little Carte D'or Chocolate Topping goes a long way.